Color scheme selection is now done with a dropdown list rather than by a numeric input. Both MT4 and MT5 now feature a description with basic instruction on use. The range of supported timeframes in MT5 is now more flexible. For example, you can use it on M6 or M12. More obvious warning when trying to use Market Profile on wrong timeframes. Faster processing with less unneeded calculations. First run calculation about 10 times faster now. Session type selection (daily, weekly, monthly) is also done with a dropdown list. 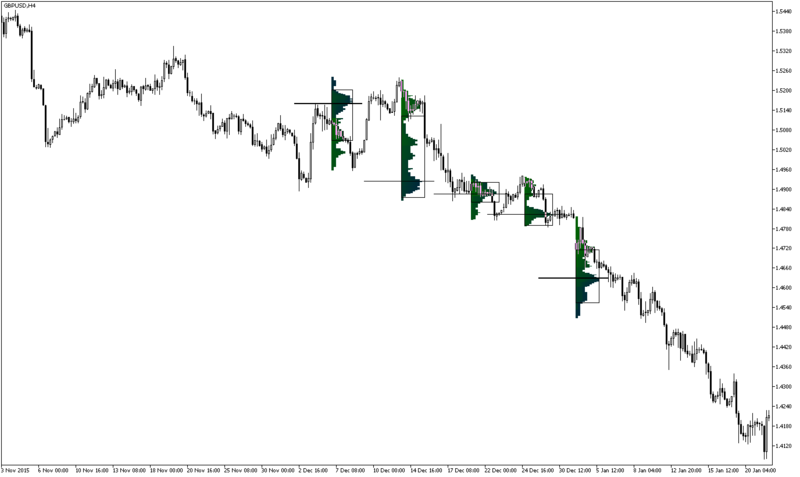 Indicator removal will not affect chart objects created manually or by other indicators. Fixed a bug that could cause “Array out of range” errors. Code rewritten according to the current MQL standards. You can get the code of the MT5 and MT4 versions or read more info about this market profile indicator. If you find any bugs in this MetaTrader indicator or if you want to make a suggestion regarding its functionality, please use the commentary form below.